There is a place under a bridge in Athlone where you will find an homage to India that you may have passed going to and from work every day and not even have known about. Rossini’s location at first seems a bit dodgy. Situated just below the bridge at the end of Kromboom road before the M5 you can be forgiven for wondering if it’s even safe to park your car there. My limited expectations, due to it’s location, were pleasantly dispelled by the inviting atmosphere inside. We arrived at about 6.30pm on a Monday in the last week of January. The restaurant was empty save for 2 staff members holding the fort. I wondered if we would be dining alone in a deserted restaurant considering it was Monday after all, not a great day for dining out. By the time we left though just before 8pm, several other tables had become occupied. The entrance to this restaurant is slightly short of it being a fort. Steel gates over the outside doors do not make for the most attractive entrance but the inside is quite a surprise. The decor leans to a Moroccan/Indian flavour, with ornate chandeliers lending a low orange glow to the dimly lit interior. The red and gold wallpaper is reminiscent of a wedding sari spread across the wall. Heavy marble topped tables finish the look. There was an attempt made to serious décor here but alas it has fallen short. The end result lacks polish but if what you’re after is the food and not the décor then this is just fine. In spite of the heavy eastern overtones the vibe is laid back and unpretentious. Our waiter was a casually dressed young Indian expat who seated us and brought us some menus then left us for about 10 minutes before returning for our order. Rossini, while having an Italian sounding name serves distinctly Indian food. They have a great variety of dishes from grills to curries and an extensive selection of drinks and fruit cocktails. The menu has been further diversified to include savoury pancakes and waffles, pizzas and even burgers. 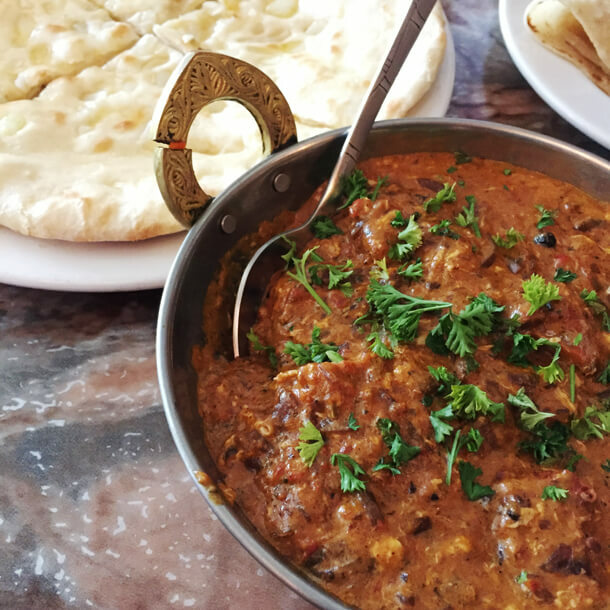 We opted for a Chicken Afghan curry which is mild curry with sauteed chicken cubes in an egg fried masala. Reminiscent of an egg tarkari perhaps. I enjoyed this but thought it was a bit too mild. Enjoyed this with an onion naan. Curries were in the region of R65 for vegetarian to R95 for meat. I thought the naans quite expensive at about R14 each. 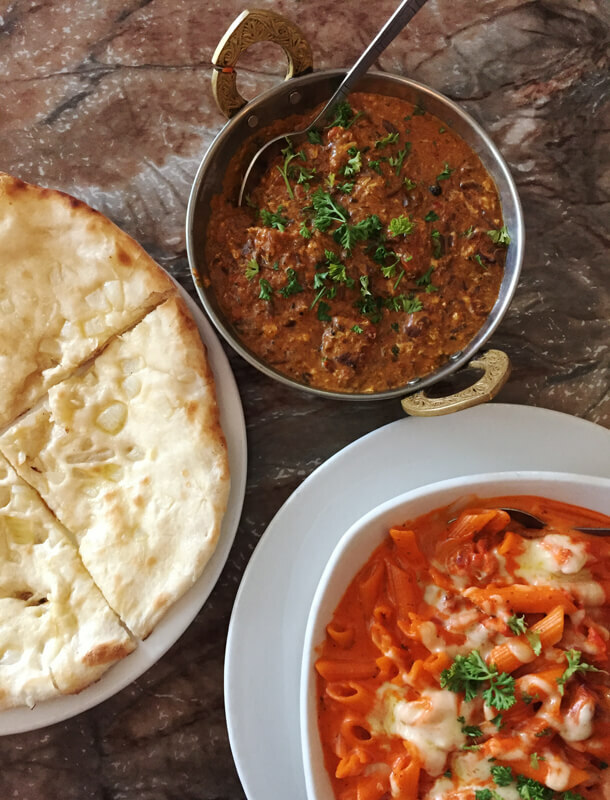 A Butter Chicken pasta, yes that’s right, pasta, was helpful for my little one who easily eats pasta. This dish was quite good although a touch sweet and topped with cheese, it threw out any semblance of the real thing. At R75 it was a very generous portion though and there was enough to take home for a second meal. So Steak and Waffles, I simply had to try it. Obviously a spin on the American South dish of Chicken and Waffles. An impressive dish to look at but I knew at first sight half of that would go home. 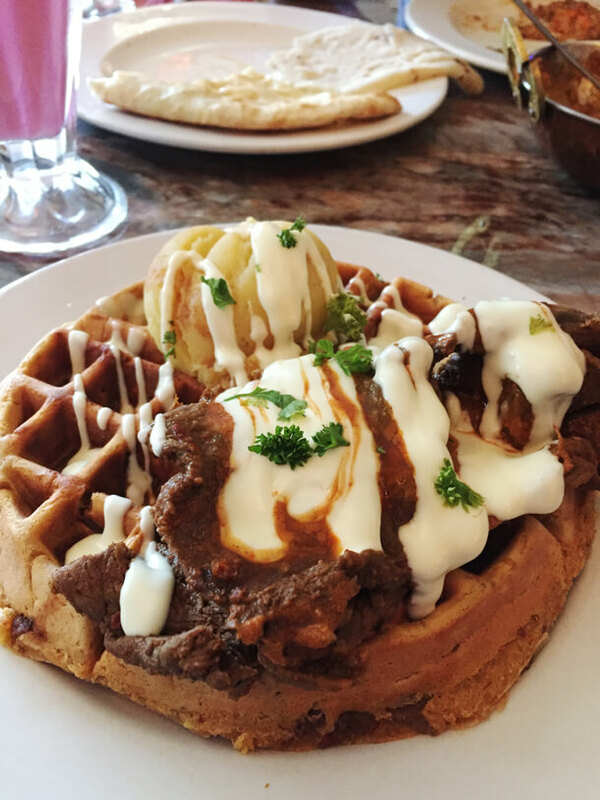 The waffle was extra thick set atop with slices of masala steak and a side of mashed potato. I found this dish too heavy as the batter of the waffle also has pieces of steak inside. The steak on top was a bit sinewy and hard to eat. The dish also could have used a more substantial sauce rather than the drizzle of mayo over it. Not something I would order again. Hubby enjoyed his Falooda and my Rose lassi was nice and thick but lacked enough rose flavour. There is a private room which can be booked for larger groups and is a great option if you have young children that you don’t want wondering off. The private room has a glass door though so not really so private. It also has a TV if your group wants to catch a game. When I was there on a previous occasion with friends we had the grill platter (very tasty), Chicken Makani (spicy), Chicken Hyderabadi (rich and creamy) and Prawn Chaat. The general concensus is that the food was pretty good. 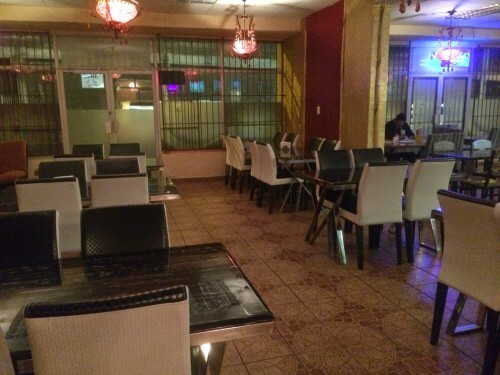 Rossini is part of the Metro complex, which also houses Arabian nights – a hooka lounge, and a takeaway. The complex is owned by brothers from Dubai which would explain the slightly different variety of dishes on the menu. This is a minimum frills kind of place. If you’re all about the food and the rest doesn’t matter, then it’s worth parking your car under the Kromboom road bridge. Rossini’s location at first seems a bit dodgy. Situated just below the bridge at the end of Kromboom road before the M5 you can be forgiven for wondering if it’s even safe to park your car there. The night that we decided to go was wet and cold. So it was a welcome relief to enter into the warmth of the mostly empty restaurant. It must be noted though that they were over half full by later in the evening. My limited expectations, due to it’s location, were pleasantly dispelled by the inviting atmosphere inside. The decor while simple and spare definitely lean to a Moroccan flavour, with ornate chandeliers lending a low orange glow to the dimly lit interior. We were meeting some friends and had booked the private room which is a great option if you have young children that you don’t want wondering off. The private room has a glass door though so not really so private. It also has a TV if your group wants to catch a game. 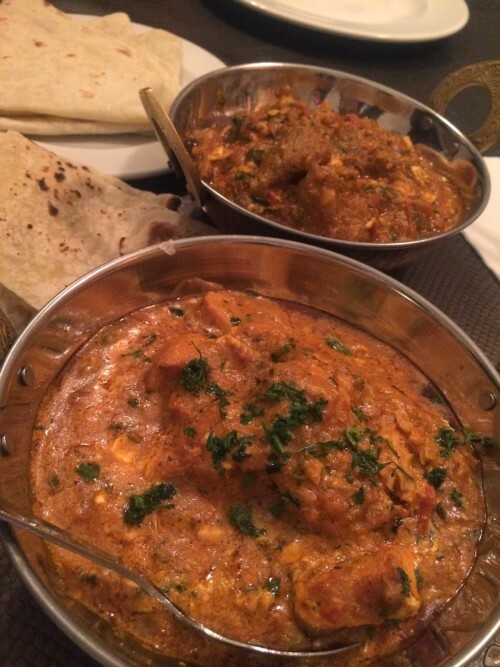 The vibe is quite casual and unpretentious, but the food is certainly something to blog about. Rossini, while having an Italian sounding name serves distinctly Indian food. 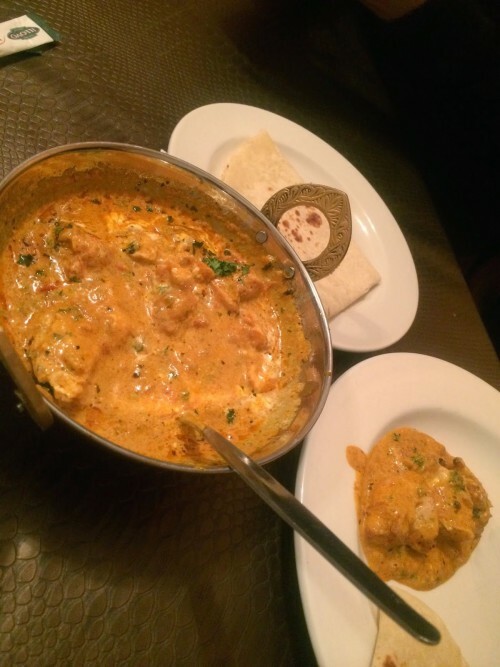 They have a great variety of dishes from grills to curries and an extensive selection of drinks and fruit cocktails. To start we tried some of the fruit cocktails. Their popular Layers coctail is definitely a winner. It’s a creamy concoction of layers of strawberry, mango, avocado and ice cream. When you have it, remember to lift the straw through the layers as you drink. That way you get a taste of each flavour in one sip. Amongst us we had the grill platter (very tasty), Chicken Makani (spicy), Chicken Hyderabadi (rich and creamy) and Prawn Chaat. The general concensus is that the food was excellent. Only one dish was not perfect and that was the prawn chaat because the prawns were undercooked. 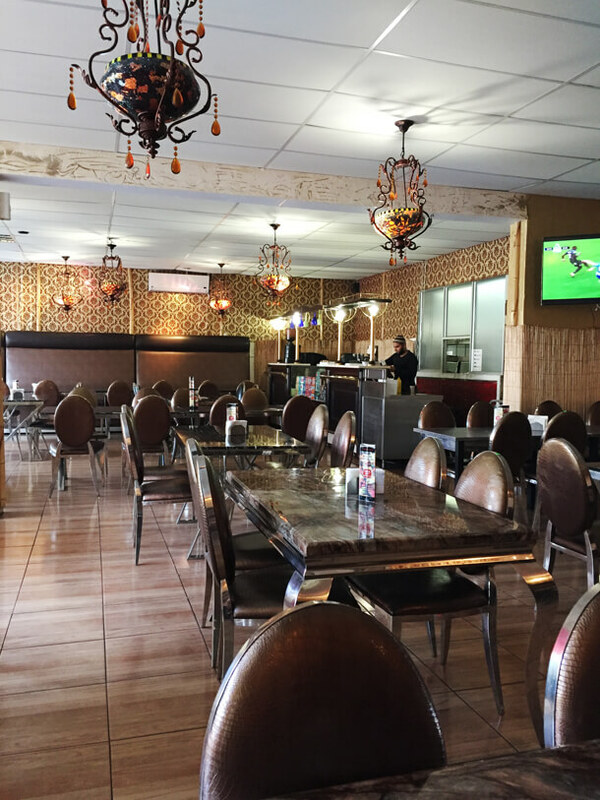 Rossini is part of the Metro complex, which also houses Arabian nights – a hooka lounge, and a takeaway. They all share a kitchen which I think can make for some chaos but on the night in question we had no problems with service. 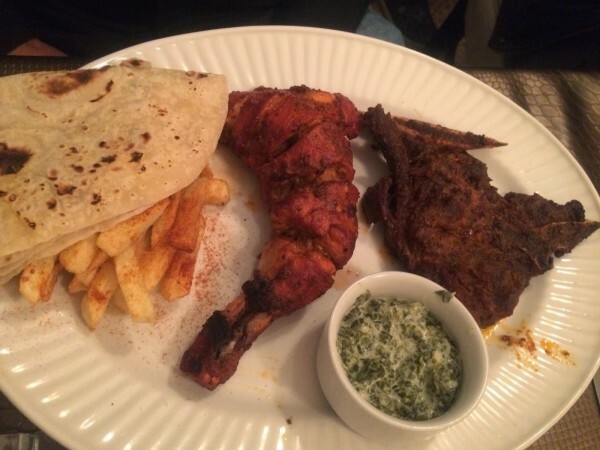 The complex is owned by brothers from Dubai which would explain the slightly different variety of dishes on the menu. I would definitely go again. It’s laid back and relaxed and the food is worth the drive to the Southern Suburbs. Very disappointed. A group of colleagues went for lunch there yesterday. We ordered and when it came to paying the bill revealed completely different prices to the menue. They insisted that we pay the prices on the bill. We were never informed of any new prices. This totally unethical and would never set foot there again and disuade anyone from going there.